For purposes of this article, any mention of homicide rates refers to reported homicide rates. 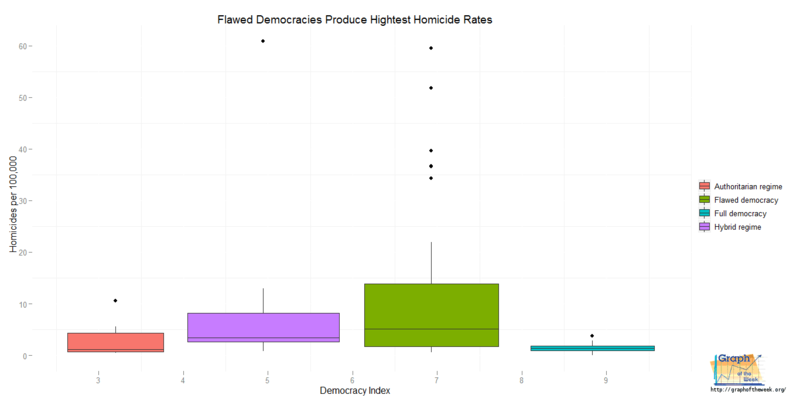 In mostly open countries (full democracies), the homicide rates are rather low when compared to other types of governments - except for authoritarian regimes. Left open to speculation, the reasons can be many. Perhaps people in free societies are happier - happy people don't tend to murder other people, otherwise they wouldn't be happy. In a previous articles, it was shown that full democracies produce longer life spans and are world leaders in technological advancements. So, not only do people thrive when free, but they live longer and pursue creativity. In mostly closed countries (authoritarian regimes), the homicides rates are also low (comparatively speaking). It's very well possible that not all homicides are reported in these countries - especially given recent events regarding the revolts in the Arabian countries (see Arab Spring). Many thousands have died during this time which would not be reported as a 'homicide.' When the government murders a person, it is viewed as eliminating a criminal - not a homicide (in all countries, that is). But if the rates are somewhat accurate, then why so low? Perhaps it is due to fear - people who are afraid for their own lives probably will not kill others if that means their own death. Who Reports the Most Homicides? These are the 2nd tier most 'free' countries. That begs the question - what exactly is a flawed democracy? It's not a simple answer - it's a rating based on a country's democracy index. In summary, it is based on five categories: electoral process and pluralism, civil liberties, the functioning of government, political participation and political culture. Click here for a full description. Why is this? Perhaps those countries have unemployment problems, gender equality problems or culture problems. The question begs further research in this area and this author has not yet found a statistical correlation. If interested, the worst offenders include Honduras, Jamaica, El Savador, Trinidad and Tobago, South Africa, Brazil, and Columbia. Anybody with insight into this area is welcome to comment. At any rate, if you are planning on visiting or moving to a country with a 'flawed democracy', you should keep the data presented here in mind. EDIT: Originally published on 2012-05-16, the above map was out of date (showing USSR instead of current global makeup). On 2012-05-25 it was replaced using current political boundaries. 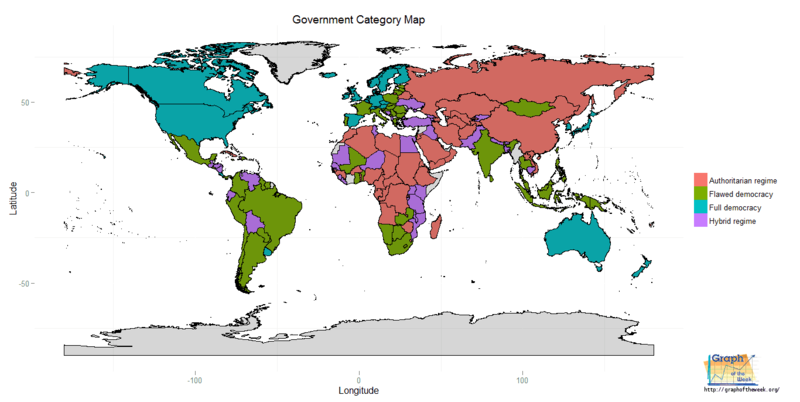 For a global map categorized by government type, see the chart above. Nearly 40% of the world is under authoritarian rule (much of that is China), while only 13% are under a full democracy. It would be interesting to see a similar map at one hundred year intervals going back in time. A country can indeed make the transition from authoritarian regime to full democracy, but usually not without significant loss of life. Both Germany and Japan were authoritarian before and during World War II, but have since become very free countries. Hopefully this will occur in the aforementioned Arabian countries as well - time will tell. This is the third article showing a relationship between freedom and its effects on people (the first two are here and here). Based on the data, this series of articles (strongly) suggests that people thrive more in free countries than oppressed ones. In this particular instance, there is a relationship between freedom and low homicide rates as well as a similar one for authoritarian regimes. All things being equal, this author chooses to live freely. Without that freedom, it wouldn't be possible to even find data for such an article as this much less publish it. Oppression is only beneficial to the oppressors. 1) When looking at history, is there an increasing or decreasing trend in the number of full democracies? 2) How many homicides are not reported? 3) What would this map look like if all wrongful deaths were accurately reported? These graphs were generated using the 'ggplot2' package within the R programming language. In the future, different plotting packages will begin to be seen here, including 3d plots and trellis plots. Stay tuned! You are correct. I've been looking for an updated map using the same tools, but no luck. I will have to do more research. Funny, because I thought that Soviet Union is long gone :-). And worse, my poor country (and other former soviet republics) is shown both as part of Russia/Soviet Union and as an authoritarian regime (with it's real democracy index only slightly below 8). Things are not so bad here. What country do you live in? Russia is still shown as an authoritarian regime. I've actually been there (to Moscow and Nizhny Novgorod) - on the day Medvedev was 'elected' president, no less. I'll never forget the towering picture of him and Putin downtown. I'm Estonian. As already pointed out, map is outdated ~20 years and Baltic states, Ukraine, Belarus, Kazahstan plus some other independent countries are still shown as part of the Soviet Union on the map (and therefore colored as authoritarian regime by default). Baltic states are certainly not authoritarian regime: http://en.wikipedia.org/wiki/File:Democracy_Index_2011.png. You probably used maps package, which strangely still consists incorrect country borders on the world map. I think it's best to use some up-to-date shape file. File from http://www.mappinghacks.com/data/ seems OK (includes South-Sudan – it should be the newest country at the moment :-)). I listed that link as a source for Democracy Index information (since you don't have to log in to see that document). However, I used the 2011 rankings which show the countries mentioned as flawed. Ah I see: You've updated not only the map but also the data. Another prejudice revised... France isn't that stable/full democracy I pictured in mind!